Bengaluru | March 13, 2019– Saankhya Labs, India’s leading wireless communication system and transformative technology solutions provider, has successfully demonstrated their new solutions for next generation communication technologies of 5G Broadcast and Direct to Mobile TV(DTM). Saankhya Labs showed a technology demonstration of their patented 5G Broadcast solution at the recently concluded Mobile World Congress (MWC) 2019 in Barcelona, Spain from 25th to 28th February. This is the first time in the world that a 5G Broadcast solution using the convergence of Broadband and Broadcast technology has been demonstrated anywhere in the world. 5G Broadcast is the next generation communication technology that is based on the convergence of Broadcast & Broadband networks. This solution enables telecom service providers to offload video traffic from their mobile network onto the ‘cellularized’ broadcast network. This will help decongest mobile spectrum use by offloading the video traffic that accounts for maximum data use. This will improve usage of mobile spectrum and increase the user experience by freeing bandwidth which will help reduce call drops, increase data speeds etc. Video traffic is the fastest growing traffic on mobile networks. World over, about 60% of mobile data usage is of video content, and this is expected to increase to over 75% by 2022. The Indian mobile market is expected to grow to more than 850 million users. 5G broadcast will help unchoke the mobile networks from this huge video traffic. This solution not only helps the Mobile Operators to free up bandwidth and provide a superior user experience, but also will help broadcasters to monetize their broadcast spectrum by reaching millions of additional mobile subscribers. 5G Broadcast has a wide variety of applications such as, Multimedia and Entertainment including HD TV to Mobile devices, Virtual Reality and Augmented Reality (VR and AR) Services. It can be a very effective solution for Emergency Broadcast Services, Internet of Things, Various Automotive applications such as Firmware Upgrade Over the Air (FOTA), broadcast of mapping and GIS data for Driverless Vehicles, Automotive Infotainment etc. (3) the analytics and decision engine software on mobile network core which enables the switching between Broadband and Broadcast networks. At MWC 2019, Saankhya’s 5G broadcast technology demonstrations generated a lot of interest among various telecom operators and broadcasters. Apart from 5G Broadcast, Saankhya’s another solution called Direct to Mobile TV (DTM), will allow mobile devices to receive terrestrial Digital TV. As more and more people are watching entertainment content on portable devices, DTM gives the option to watch Free to Air Linear TV such as Live sports, news etc on their mobile devices without buffering and without a data network. Both the technology solutions i.e. 5G Broadcast and Direct to Mobile TV are powered by Saankhya’s indigenous Pruthvi-3 Chipsets based on award winning and patented SDR architecture. Pruthvi-3 is a fully programmable multi-standard chipset that supports next generation communication standards. Pruthvi-3 chipset was launched last year in December by Hon’ble Minister of State for Communications, Shri. Manoj Sinha. Luxembourg | October 15, 2018– Intelsat S.A., the world’s leading provider of satellite services and integrated communications, announced today it is launching FlexExec, a managed end-to-end service enabling service providers to easily and cost-effectively deliver high-performance, in-flight broadband connectivity to business jets globally. Boston, USA | September 24, 2018– FTS announces at the APEX EXPO Boston 2018 that it has signed a landmark agreement to equip Donghai Airlines fleet with its XStream-SAT Next Generation Inflight Broadband system. The agreement is significant as it will be first fully “Connected Aircraft” implementation in China to integrate both cockpit and passenger cabin applications over Inflight broadband connectivity service. Boston, USA | September 24, 2018– With the CAAC (Civil Aviation Authority of China) relaxation of regulations early this year to allow passengers to use smartphones during flights, the China market has been buzzing with activities in a rush to provide Inflight Connectivity. FTS announced at the APEX Expo 2018 in Boston, USA, that it is partnering with Qingdao Airlines in China to equip its entire fleet of A320 aircraft with the FTS XStream-SAT Broadband Connectivity system. Qingdao Airlines is a fast expanding private airline in China, currently operating a fleet of 14 A320s and serving a route network of over 20 domestic destinations. With its commitment to “Passenger First”, the airline has been outperforming the market and plans to expand to over 100 aircraft by 2025. “Even before the lifting of the ban on passengers using their smartphone, we had been actively looking for a solution that meets our needs. The timing is right now that the smartphone ban was lifted, ChinaSat launched its Ka-band satellites CS-16 and FTS is here with its XStream-SAT system to complete the puzzle“, said the spokesperson for Qingdao Airlines. 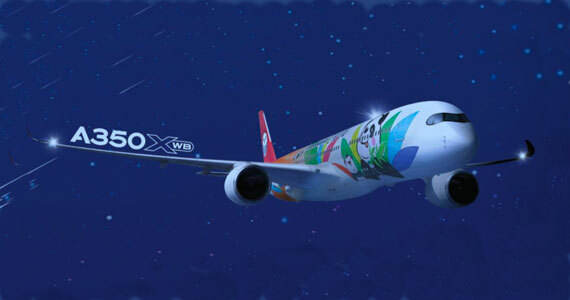 “We are extremely honored and delighted to be working with Qingdao Airlines on this groundbreaking agreement to equip their fleet with our XStream-SAT Broadband Connectivity solution. In the end what won them over is that we are not just offering hardware, but a total solution including a business management platform that helps minimize cost, improve operational efficiency and maximize ancillary revenue. FTS can offer local support, integration services and market know-how that differentiates us from other providers,” added Mr. Duan Shiping, President of the FTS group. This Week’s News From Rockwell, Astronics, SITA and Others! Rockwell Collins’ industry-leading MiQ seating platform has been chosen by Turkish Airlines for the business class cabin of its new fleet of medium-haul, single-aisle aircraft. Initial deliveries of 92 shipsets for Airbus A321neo aircraft and deliveries of 77 shipsets for Boeing 737 MAX aircraft are now underway. MiQ’s award-winning design is available for business class and premium economy seating for both narrow- and wide-body aircraft. Astronics is celebrating it’s 50th Anniversary! Happy Anniversary from IFExpress! and, oh yes, Astronics PGA Solutions was selected by AMAC Aerospace for a VIP jet completion program – A Boeing 747-8 Intercontinental VIP jet will incorporate Astronics PGA inflight entertainment and cabin management systems. GOL, Brazil’s largest airline, is introducing new self-service bag-drop technology to speed up the airport experience. Passengers of the carrier, can now use SITA’s Scan&Fly to check in their bags when flying domestically from Rio de Janeiro International Airport and will soon be able to do so at São Paulo–Guarulhos International Airport as well. This self-service option halves the time it takes to check in a bag and gives passengers more control over their journey. Each year, GOL flies around 32 million passengers. Providing significant reductions in the time it takes to check in is a major bonus for passengers, as well as helping GOL reach the targets set as part of the IATA Fast Travel program. SITA is providing 24/7 support both on the ground and through the SITA Command Centers, which proactively detect issues to avoid any passenger disruption. That monitoring ranges from tracking surges in internet usage which might have an impact on the airport, to alerting the team on the ground that bag tag paper supplies are running low. Airborne Wireless Network announced that they are implementing a 30,000-to-1 reverse stock split. every 30,000 shares of the Company’s common stock outstanding will be automatically combined into one new share of common stock without any action on the part of Airborne Wireless Network stockholders. As a result of the reverse stock split, there will be approximately 296,000 shares of common stock outstanding (subject to adjustment due to the effect of rounding fractional shares into whole shares). Airbus Perlan Mission II, the world’s first initiative to pilot an engineless aircraft to the edge of space, made history again yesterday in El Calafate, Argentina, by soaring in the stratosphere to a pressure altitude of over 62,000 feet (60,669 feet GPS altitude). This set a new gliding altitude world record, pending official validation. The pressurized Perlan 2 glider, which is designed to soar up to 90,000 feet, passed the Armstrong Line, the point in the atmosphere above which an unprotected human’s blood will boil if an aircraft loses pressurization. This marks a second glider altitude world record for Jim Payne and Morgan Sandercock, the same two Perlan Project pilots who soared the Perlan 2 to 52,221 feet GPS altitude on Sept. 3, 2017, in the same remote region of Argentine Patagonia. The 2017 record broke a previous record that was set in 2006, in the unpressurized Perlan 1, by Perlan Project founder Einar Enevoldson and Steve Fossett. Another first-of-its kind achievement this year for the Perlan Project was the use of a special high-altitude tow plane rather than a conventional glider tow plane. During yesterday’s flight, Perlan 2 was towed to the base of the stratosphere by a Grob Egrett G520 turboprop, a high-altitude reconnaissance plane that was modified for the task earlier this summer. Operated by AV Experts, LLC, and flown by chief pilot Arne Vasenden, the Egrett released Perlan 2 at around 42,000 feet, the approximate service ceiling of an Airbus A380. Boeing reports that the Asia Pacific region will have the greatest global demand for new civil aviation personnel over the next 20 years. The region is projected to account for 33 percent of the global need for pilots, 34 percent for technicians and 36 percent for cabin crew. The 2018 Boeing Pilot & Technician Outlook is an industry forecast of new aviation personnel demand. It is closely tied to projections for new airplane deliveries around the globe. As with personnel demand, the Asia Pacific region leads demand for new commercial airplane deliveries over the next 20 years. Forty percent of all new passenger airplane deliveries in the next 20 years will be delivered to airlines in the Asia Pacific region. New commercial technician demand decreased five percent to 242,000. This is due to advancements in product development on the 737 MAX, which have resulted in increased maintenance efficiencies. Overall, maintenance hours required over the life of the airplane will be reduced. New commercial cabin crew demand increased three percent to 317,000 due to anticipated fleet mix, cabin configuration and regulatory requirements. For the first time, the outlook included the helicopter and business aviation markets. The inclusion of these sectors increases the region’s demand to 261,000 pilots, 257,000 technicians and 321,000 cabin crew. Boeing’s Pilot Development program is an accelerated training program intended to guide pilots from early stage ab-initio training through type rating as a first officer. Check out this article in VenturBeat on Gogo’s use of AI for machine learning tools to personalize your IFE experience and hardware monitoring – How Gogo uses AI to predict equipment failures, personalize customer experiences | VentureBeat – One clever use monitors the cooling fans speed to monitor system temperature. The off load the data on the cell links on the ground and analyze the data there. Over the past year, there have been numerous IFEC personnel changes that have the potential to impact and influence the direction our industry is charting. Thales and Gogo have many new entrants to the industry on their employment roster, as well as, new leaders at the helm; while the vast majority of Panasonic’s upper management has been rolled over in the past 18 months. As new folks enter the market we strongly expect both product and product direction changes in the inflight & avaition arena. With these new teams in place, we also anticipate new market opportunities to open up with the cross pollination from other technology industries where many of these new entrants stem from. Debt will also become a driver that will focus modifications of current business products and create new product directions. One area we see with a strong growth is data. Data from passengers, from the airlines, and data from (and to) hardware. Specifically, we see the potential of new data products/analytics about the aircraft and it’s hardware. With the growth of data, we expect malware increases as well – something is bound to happen. While we will watch and report what we see coming, keep your eye on the future of AI and it’s ability to help determine product condition and passenger needs! Satcom Direct, the business aviation connectivity, software and hardware provider, has confirmed its first Jet ConneX installation for Deer Jet subsidiary, Hongkong Jet. The ultra-high-speed Ka-band service, powered by Inmarsat’s Global Xpress satellite constellation, is being supplied to a privately-owned Gulfstream G650ER, managed and maintained by Hongkong Jet. Installed at Gulfstream’s Long Beach, CA. facility and activated by SD in early summer, the system delivers unrivaled cabin access to the highest data speeds available to business aircraft in the sky. “The principal runs a large, international Chinese conglomerate so the ability to use voice and text services, download and email documents, and surf the web, are fundamental to his business. His family often travels with him and they want to stream video, watch favorite TV series, and big sporting events. The need to deliver constant, reliable, secure connectivity is essential. With Jet ConneX installed the cabin is truly a home from home, as well as an office in the air,” says Mike Walsh, chief commercial officer, Hongkong Jet. The Satcom Direct Router, SDR, seamlessly delivers the high-speed connectivity throughout the G650ER cabin to all passenger devices. In addition, data integrity is maintained by the SD suite of cyber security software solutions which while managed by the SDR, are supplemented by certified SD experts, to proactively mitigate potential threats and block intrusion attempts in real-time.“The data security offering, the standard of SD global customer service, and the ability to respond 24/7 to resolve potential issues, played a significant part in our decision to appoint them as the Ka-band provider. Our clients expect us to maintain the aircraft to the highest standards and we rely on SD to meet and exceed those expectations in terms of connectivity,” said Denzil White, chief executive officer, Hongkong Jet. SITAONAIR’s EFB Weather Awareness Solution (eWAS) is the latest application certified by Inmarsat for use across its next-generation SwiftBroadband-Safety (SB-S) communications platform for the flight deck, allowing airlines to now receive the latest weather view in real-time during flights. Following its certification under Inmarsat’s Aviation Certified Application Provider (CAP) program, eWAS users will now be able to seamlessly utilize SITAONAIR’s best-in-class technology for pilots using real-time SB-S datalink connectivity. The popular pilot weather solution offers up to-date views of severe weather, which can then enable a smoother, more efficient inflight experience for passengers and crew – and avoid related cost implications that were once deemed unavoidable. Severe turbulence, lightning, ice crystallization and other volatile weather phenomena can significantly impact an airline’s bottom line, with a single weather event sometimes costing hundreds of thousands of dollars, in addition to negatively impacting on-time performance targets. Such weather phenomena can rapidly appear, shift location, and grow in intensity, posing an increasing problem for airlines that traditional weather briefing packages cannot deal with. Boeing named Brendan Curran president of Boeing AvionX, an organization formed last year to pursue the development and production of avionics and electronics systems. Curran, who has more than 20 years of aerospace industry leadership, joins Boeing from Crane Co., where he served as president of the Aerospace & Electronics Group. In this newly-created position, Curran will work across Boeing’s commercial, defense and services businesses to further mature the company’s aftermarket strategy. He will help advance overall capabilities of the Boeing AvionX organization to provide greater value to customers while driving long-term services growth. Curran will report to Stan Deal, president and CEO of Boeing Global Services. “The success of Boeing AvionX depends on aftermarket technologies and innovations that exceed our customers’ needs, as well as developing avionics products that add value to our commercial and government platforms,” said Deal. “Brendan’s extensive expertise, especially as it relates to aftermarket strategies, will enable us to harness incredible opportunities so we can provide our customers more value throughout the life-cycle of their investments.”Prior to Crane Co., Curran was vice president of Business Development, Strategy and Partnerships for commercial engines at Pratt & Whitney, a United Technologies Company. Before that, Curran was vice president and general manager of Repair and Supply Chain for Hamilton Sundstrand, a United Technologies Company. Panasonic Avionics Corporation (Panasonic) has appointed Catherine L. Razzano as Chief Compliance Officer. Catherine will be responsible for overseeing Panasonic’s compliance with laws, regulatory requirements, policies and procedures, and will report directly to the General Counsel of Panasonic Corporation of North America (PNA) with a dotted line reporting structure to Panasonic’s Chief Executive Officer, Hideo Nakano. She joins Panasonic from General Dynamics Corporation where she held the position of Assistant General Counsel and Director from 2010. Her responsibilities included counsel on business and legal strategies, budget management for the legal department and serving as lead counsel to the company’s Government Relations Department. At General Dynamics, she also focused on the company’s compliance with anti-bribery laws, export controls, economic sanctions and other trade embargoes, anti-boycott regulations, anti-money laundering laws, and third-party intermediary agreements and due diligence requirements. Gogo, the leading global provider of broadband connectivity products and services for aviation, today announced its financial results for the quarter ended June 30, 2018. Check out the financial report here. If you are interested in aircraft and computing, you had better understand edge computing: CB Insights writes: “Edge computing makes faster data processing for autonomous vehicles possible. This technology enables connected devices to process data created at the “edge,” which is either within or much closer to devices themselves.” Check it out here – What Is Edge Computing? This week we have plenty of news from some regular contributors and others as well. So let’s get started! The new onboard entertainment and digital services platform “Wamos On Air”, designed and developed by Immfly, is now available and passengers will be pleased with a broad range of entertainment possibilities easily accessible via their own personal devices (phones, tablets, and laptops). The major goal of both companies is to exceed travelers aspirations and improve their customer journey while providing a digital transformation through entertainment and content marketing. The airline that has 1.000.000 annual passengers, counts now with an in-flight digital platform “ Wamos On Air ”, that is available in Boeing 747-400, also called as “Jumbo” aircraft. Passengers can easily access the onboard service by activating the airplane mode on the mobile, tablet or laptop; selecting the Wi-Fi network and typing www.wamos-onair.com at the browser. Several movies, but also TV-shows, Press, Magazines, Kids section are now at passenger’s fingertips disposal. Recent examples such as “The Shape of Water”, “The Revenant”, “The Greatest Showman”, “X-Men”, “Birdman” and many others, make the Wamos’s aircraft space a cinema on air, with an atmosphere that breathes digital experiences. As the airline’s audience is considerably diverse, Wamos Air and Immfly focused on providing different content modules for every type of passenger (distinct ages and languages). There is Kids section dedicated to the youngest, Music in documentary format, multiple games, all of that available both in English and Spanish languages. Astronics Corporation, a leading supplier of advanced technologies and products to the global aerospace, defense, and semiconductor industries, reported financial results for the three and six months ended June 30, 2018. Results for the quarter and the first six months of 2018 include the results of Telefonix PDT, which was acquired on December 1, 2017 and Custom Control Concepts (“CCC”), which was acquired on April 3, 2017. Click here to view the entire release, including financial statements. This August, pending final regulatory approvals, Bluebox will bring wireless IFE to the skies of India across Vistara’s current fleet of 21 Airbus A320 aircraft, with more A320 aircraft on the way. As part of a new fare families announcement yesterday, Vistara announced the introduction of ‘Vistara World’, its free in-flight entertainment system with more than 70 hours of video and audio content streamed wirelessly onto personal handheld devices and laptops. Today, Bluebox is thrilled to confirm that Bluebox Wowhas been selected as the technology solution to deliver ‘Vistara World’ to passengers on board Vistara flights. ‘Vistara World’ is expected to be rolled out fleet-wide in August 2018, subject to regulatory approvals. It will offer a content-rich multimedia library that includes music in genres like Pop, Jazz, Blues, Rock, Electronica, English Retro and Indian, Bollywood and Hollywood movies of various categories such as Drama, Romance, Comedy, Thriller, Action, Adventure, etc., Indian and International short programs as well as a variety of reading material including Vistara’s in-flight magazine. Bluebox’s portable wireless streaming platform provides content streamed to passenger devices in any aircraft cabin, providing the capability of storing up to 1.6 Terabytes of film, TV, audio, games and other digital content. With a remarkably low cost of ownership, it is a discrete, portable, lunchbox-sized unit. Stowed securely in overhead bins, each box’s single, swappable rechargeable battery delivers up to 15 hours of simultaneously streamed video content. Inflight Wi-Fi is a key driver in forming customer loyalty and satisfaction among today’s airline passengers, according to the industry’s largest poll of passenger attitudes. The fourth annual global Inflight Connectivity Survey is published today by Inmarsat (LSE: ISAT.L), the world’s leading provider of global mobile satellite communications, in association with market research company Populus. Wi-Fi is already an essential part of everyday life on the ground with more than three quarters of those surveyed (78%) believing that it is “fundamental” to daily life. With more than half of passengers (55%) describing inflight Wi-Fi as crucial, meeting the demand for Wi-Fi in the skies is key to improving passenger experience and driving loyalty. Wi-Fi is now so critical to passengers that two thirds (67%) would be more likely to rebook with an airline if high-quality Wi-Fi was on offer. Globally, passengers ranked inflight Wi-Fi as the fourth most important factor that they consider when choosing an airline, behind airline reputation, free checked baggage and extra leg room. The impact of inflight Wi-Fi on loyalty and satisfaction is particularly significant for passenger groups most keen to remain connected in the air. High-value customers, parents and young passengers are among those most likely to use inflight Wi-Fi services: nine in ten business travellers (90%), parents travelling with children (90%) and 18-30 year olds (91%) plan to use the service if it’s offered when they next fly. Onboard Wi-Fi could also lead to more productive business trips, as almost nine in ten business travelers (87%) would use inflight Wi-Fi to continue working on the plane. Access to Wi-Fi is also an important driver of choice for nervous flyers, as more than half (51%) said that they would use the technology to remain in contact with family and friends on the ground. The majority of today’s airline passengers are so keen to get online that they will sacrifice other inflight amenities for internet access. Inmarsat’s 2016 Inflight Connectivity Survey revealed that more than half of passengers (54%) would choose Wi-Fi over an inflight meal. Today, passengers are adding alcohol to the list of inflight amenities they would sacrifice to get online, with more than half (53%) suggesting they are even prepared to give up their inflight alcoholic drink in exchange for access to Wi-Fi. As demand for inflight Wi-Fi soars, uptake is similarly high as two thirds (65%) of passengers that had access to the service in the past year chose to use it. However, the demand for quality onboard Wi-Fi is significantly outstripping supply on the fleets of airlines across the globe, as less than half of passengers globally (45%) traveled on flights where it was offered. Indonesia | July 31, 2018– Inmarsat, the world’s leading provider of global mobile satellite communications, has signed a contract with Mahata Aero Teknologi (MAT), an Indonesian wireless technology provider, to deploy Inmarsat’s GX Aviation inflight broadband solution on a fleet of 50 Airbus A320 aircraft for Indonesian low-cost airline Citilink. The new Airbus BelugaXL’s first flight was a few days ago and the airplane’s “face” was just too good not to make it the rectangle for this week’s IFExpress. Following the first flight, the BelugaXL will undergo some 600 hours of flight test over 10 months to achieve Type Certification and entry into service later in 2019. The BelugaXL program was launched in November 2014 to address Airbus’ transport capacity requirements in view of the A350 XWB ramp-up and Single-Aisle production rate increases. Five aircraft will be built between 2019 and 2023 to gradually replace the five BelugaST. The aircraft will operate from 11 destinations as Airbus’ method of transporting large aircraft components they say. Based on an A330-200 Freighter, the BelugaXL is powered by Rolls Royce Trent 700 engines and can haul an incredible 50 tons of load with a total take-off weight of 230 tons! It will haul some 30% more than it’s predecessor. It is longer by 20 feet as well. The lowered cockpit, the cargo bay structure and the rear-end and tail were newly developed jointly with suppliers, giving the aircraft its distinctive look. 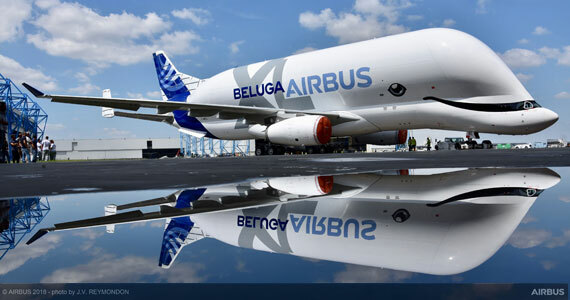 Congratulations Airbus, the BelugaXL is a “whale” of a good looking airplane! We also noticed that Boeing and Airbus were selling their smaller and newest single aisle planes: Airbus A220 – 60 sales, and Embraer – 300 plane sales, as this small aircraft market also took off. The National Research Council of Canada (NRC) and Airbus have renewed their framework agreement on research and technology (R&T) cooperation. This new five-year agreement builds on a long-standing relationship between the two organizations to cooperate on R&T development which spans more than 30 years. The NRC-Airbus agreement will cover a wide range of technical subjects and technologies. Recently, Airbus identified Canada as its “fifth country” for research and technology developments in the areas of drones and urban mobility. Boeing released its 2018 Pilot & Technician Outlook, projecting demand for 790,000 pilots over the next 20 years. This represents double the current workforce and the most significant demand in the outlook’s nine-year history. The demand is being driven by an anticipated doubling of the global commercial airplane fleet — as reported in Boeing’s Commercial Market Outlook — as well as record-high air travel demand and a tightening labor supply. This year’s outlook also includes data from the business aviation and civil helicopter sectors for the first time. Iridium Communications Inc. and Rockwell Collins signed an agreement to make Rockwell Collins the newest service provider for Iridium Certus satellite solutions over the Iridium NEXT network. Rockwell Collins will be adding the service to its comprehensive suite of aircraft connectivity applications for commercial, government and ARINCDirectSM business customers. In addition to being a service provider, Rockwell Collins is also a value added manufacturer (VAM) for the design and production of Iridium Certus service terminals. As a VAM and a service provider, Rockwell Collins will play a critical role in delivering the next-generation L-band broadband solution to commercial, business and government aviation customers around the world. Initial flight trials will take place later this year, with Iridium Certus commercial service introduction for aviation users expected in mid-2019. Commercial service introduction for other verticals, such as maritime and land-mobile, is planned for 2018. Iridium Certus is powered by Iridium NEXT, the Company’s next-generation satellite constellation, currently being deployed. To date, there have been six successful Iridium NEXT launches, deploying 55 new satellites to orbit. Two more launches are planned for 2018, each carrying 10 Iridium NEXT satellites, for a total of 75 launched, with 66 in the operational constellation and nine serving as on-orbit spares. The seventh launch is currently targeted for July 25, 2018 out of SpaceX’s west coast launch site at Vandenberg Air Force Base in California. “Iridium Certus will be an important new service addition to meet the connectivity needs of commercial, business and government aircraft,” said Michael DiGeorge, vice president of Commercial Aviation Services for Rockwell Collins. “For our ARINCDirect business aviation operators, Iridium Certus offers small form factor antennas and terminals which are ideal for operators of smaller aircraft requiring internet connectivity. For our airline and government customers, the Iridium Certus service enables a variety of capabilities for cockpit safety, enhanced aircraft reporting, graphical weather, EFBs and other operational aircraft services. The new agreement builds on the long-standing relationship between Rockwell Collins and Iridium, which spans more than a decade and began with the advent of Iridium aviation service offerings. North America-based Flying Colours Corp. is installing Gogo AVANCE L3 air-to-ground connectivity systems in two Bombardier Challenger aircraft, a CL604 and CL605. The installation of the small form, fully integrated AVANCE L3 inflight connectivity and entertainment solution represents a first for Flying Colours which has already installed several of the AVANCE L5 systems. Once installed the Gogo AVANCE L3 system will provide passengers with access to the Gogo Biz Broadband network and will support, dependent on package, access to voice, email, web browsing, moving maps, and a selection of movies and TV programs. Luxembourg | July 17, 2018–Intelsat S.A. (NYSE: I), operator of the world’s first Globalized Network and leader in integrated satellite solutions, announced that it has joined the Seamless Air Alliance, a consortium dedicated to the development and promotion of standards to facilitate a better, more seamless, inflight connectivity experience for passengers. The standards would eliminate the immense costs and hurdles commonly associated with acquisition, installation, and operation of data access infrastructure by streamlining system integration and certification, providing open specifications for interoperability. More importantly, it would empower mobile operators to extend their services into airline cabins and airline passengers to board any flight on any airline anywhere in the world and use their own devices to automatically connect to the Internet, with no complicated login process and no paywall to scramble over. With satellite serving as the primary means to connecting aircraft, Intelsat will contribute in the integration of geostationary and low-Earth orbit satellite solutions into the hybrid network and help define standards, test equipment and develop service packages focused on the aeronautical market. GEE Product Highlights and News From Gogo, Inmarsat, SITA and More! During AIX in Germany, IFExpress had the opportunity to stop by the Global Eagle (GEE) stand to find out their latest news and developments. Mike Moeller gave us a run down on some of their product/service offering highlights. First, we got an over view of MASFLIGHT, their operation solutions platform that enables aviation big data solutions. MASFLIGHT’s platform offers a single source for operations data in real-time for decision making, as well as, historic data for predictive analytics. Gee uses cloud technology to collect, compile, validate and host information sets. They have also partnered with companies like the FAA, Google, Amazon and others in an effort to offer a ‘one stop’ solution for aviation information management and analysis. Mike also addressed their product, NAVAERO, their EFB solution. NAVAERO is a tablet-based and aircraft-dedicated tool for airlines to increase their operational efficiency. “Airlines have the ability to improve their operating economics through real-time analysis that connectivity technology and the EFB allow.,” said Mike Moeller. “This system is a generic PMA’d technical installation solution that allows for aircraft deployment of virtually any commercially available COTS tablet device.” Adaptability, flexibility, and upgradeability of the system architecture and the design components while maintaining airworthiness compliance is one of the strengths of NAVAERO. Apparently upgrading the system is easy, since GEE has designed modularity into the tBagC2(2) – think memory, processor and storage here. This allows the internal CPU components to be upgraded without modifications to the unit’s structural form factor at a very affordable price point. GEE’s Airtime product line was also touched upon. In case you don’t know Airtime is the central platform for passengers on an aircraft that is installed with GEE’s satellite-based service. Think of it as an entertainment gateway where airline brand loyalty can be built. Airtime can connect through any mobile device (iOS and/or Android). The customizable portal is adaptable, programmable and facilitates differentiation and personalization of the airline brand. Via the inflight Wi-Fi. Airtime allows the airline to address customized marketing programs for new product launches and brand awareness. A bi-product of Airtime is AIRTIME Content-to-Go, which is designed to engage passengers throughout their journey. The low-cost IFE solution app, Airtime Content-to-Go, allows the passenger to create their own IFE experience. The aviation traveler can tailor their onboard entertainment by securely downloading digital content to their PED prior to take-off. “This is not your father’s GEE!” said Mike Moeller – and we have to agree with him. In a world where constant connectivity is the norm, and stress among travelers is high, staying connected in flight is having a calming effect on passengers. According to Gogo’s most recent Global Traveler Study, more than 75 percent of travelers say having inflight internet makes them feel less anxious because they can stay in contact with friends and family on the ground. Sixty-five percent say it makes them feel less anxious because they can stay connected to work. Not only do passengers want to be connected, their expectation is to be connected in the same way in flight as they are on the ground, which means multiple screens doing multiple activities. Seatback Screens aren’t dead – Passengers still like seatback screens. Half (47%) of air travelers prefer seatback screens in flight versus 33 percent who prefer their own personal devices. Travelers preferring seatback screens like the ease of use (more than half like that they don’t have to worry about charging their device). Among those preferring their personal devices, 65 percent cite privacy as the primary reason. The Gogo Global Traveler Research Study explores the changing behaviors of airline passengers across the world as it pertains to inflight connectivity and entertainment. The study has been significantly expanded for 2018 and now includes data gathered from more than 9,000 air travelers in 18 countries. To learn more or to download the complete report, visit gogoair.com/globaltraveler. Inmarsat, announced that its market-leading Jet ConneX business aviation inflight Wi-Fi service has been installed and activated on 275 business jets worldwide. The impressive milestone was reached less than 18 months since Jet ConneX entered commercial service, highlighting its rapid uptake across the world. As the only global, high-speed inflight Wi-Fi option for business jets today, it offers the same fast and reliable connectivity in the air that has previously only been available on the ground. Market-leading business jet manufacturers Gulfstream, Bombardier, Dassault and Embraer have all selected Jet ConneX as a preferred line-fit option. In addition, Inmarsat has experienced substantial adoption of the solution on a retrofit basis, with more than 40 type certificate and supplemental type certificate (STC) approvals already secured, including for all Boeing and Airbus VVIP type models. Using Inmarsat’s advanced Ka-band satellite network, Jet ConneX offers data plans up to 15Mbps and consistent global coverage across all airline routes enabling the business traveler to do business wherever and whenever. Aircraft connect to the service using Jet Wave hardware, which is manufactured exclusively by Honeywell Aerospace. To date, more than 1,000 of these JetWave systems have already been delivered by Honeywell to business aviation and commercial airline customers. Using Inmarsat’s advanced Ka-band satellite network, Jet ConneX offers data plans up to 15Mbps and consistent global coverage across all airline routes enabling the business traveler to do business wherever and whenever. Aircraft connect to the service using Jet Wave hardware, which is manufactured exclusively by Honeywell Aerospace. To date, more than 1,000 of these JetWave systems have already been delivered by Honeywell to business aviation and commercial airline customers. Inmarsat, also announced that its European Aviation Network (EAN) inflight Wi-Fi solution will be available for the business aviation market by January 2019. EAN is the world’s first inflight Wi-Fi solution that integrates connectivity from a satellite, operated by Inmarsat, and an LTE-based ground network, operated by Deutsche Telekom, covering all 28 member states of the European Union, as well as Switzerland and Norway. The unique combination of a satellite and 4G LTE-based ground network offers lightning fast, low-latency performance over land and water. It can therefore meet highly demanding internet use, such as working with remote business desktops, streaming high-definition videos, enjoying online gaming and sharing images, with service levels that compare to mobile broadband on the ground. Aircraft connect with the network using award-winning small, ultra-lightweight, low drag hardware that is cost-effective to install and operate, making EAN ideal for small to mid-sized business jets, in addition to larger sized jets. EAN’s integrated satellite and ground network is fully operational, with a number of flight trials successfully completed across Europe, demonstrating that the next-generation service meets its design performance in practice. The evaluations were conducted with partners Cobham, Thales and Nokia using a CESSNA 550 Citation II provided by Dutch company NLR. Designed to meet the needs of European’s congested skies, EAN recently won the Airline Passenger Experience Association (APEX) Award for ‘Best Inflight Connectivity Innovation. 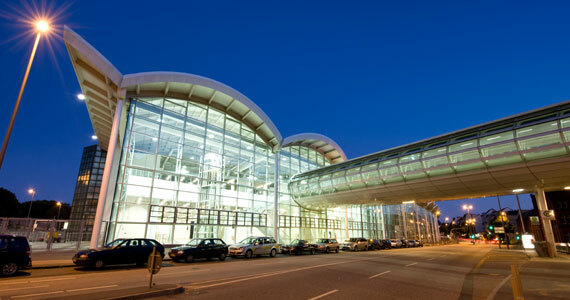 Incheon International Airport has deployed SITA’s award-winning self-service bag drop technology at its new Terminal 2, effectively serving the influx of visitors to the recent Winter Olympics and in preparation for the 100 million passengers projected by 2030. Drop&Fly simplifies the bag drop process, cutting time for passengers and improving their experience. This technology also makes more efficient use of terminal capacity and ensures more accurate baggage handling. Like wine? Heard of artificial Intelligence, AI? Well, they might be connected, especially since there are so many available. Wine preferences are the solution of selection and subjects of collateral filtering, content based recommendations, and a lot of computer analysis are parts of the sensory selection solution on a scientific platform. There is a tasting app, Wine Ring, and possibly, you can better decide your choice on a plane. In fact, the links below proves the connection between choice and selection using AI. https://recode.cmail20.com/t/d-l-bsdjld-atlydhdjy-p/ and Wine Ring. News From Gogo, Panasonic, Rockwell Collins and More! Gogo’s 2Ku inflight connectivity solution has been chosen by Air Canada for its Bombardier CS300 aircraft. The technology will be installed as a line-fit option at Bombardier. “Air Canada was the first in Canada to deploy the service on their entire mainline fleet of aircraft. They have been at the forefront of technology adoption and we are excited to deploy 2Ku on additional aircraft,” said Oakleigh Thorne, Gogo’s president and CEO. “We also are excited to work with Bombardier to have this technology installed at the factory.” Air Canada has 45 CS300 aircraft on order with an option for an additional 30 aircraft. Air Canada now has over 170 narrow and widebody aircraft committed to the technology. More than 2,000 aircraft are slated to be installed with Gogo’s 2Ku technology representing 16 of the world’s leading airlines. Today, more than 650 aircraft are flying with the 2Ku technology. 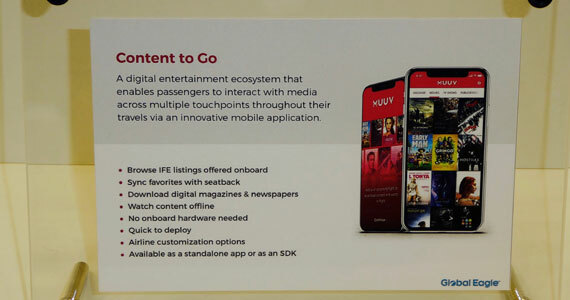 But the AIX story about Gogo is bigger than that – previously, Gogo has been discussing 2Ku and the technology in line for airline customer connectivity and entertainment. At the show, the company was talking about an interesting development they call their FLEX system. The Gogo FLEX Inflight System comprises all of the onboard hardware and software required to deliver and manage inflight connectivity for the aircraft. This includes a component they call FLEX Developer, which will allow airlines to use Gogo APIs and SDKs to bring development in-house, or turn to third-party providers for total flexibility in designing the passenger experience. But, the FLEX System is also enabling a series of products and services specifically for airline operations so the airline can extract value from the aircraft presently installed with Gogo’s hardware and software. Obviously, crew applications for connectivity and communication are already in play. The FLEX system is also a way to deliver data to and from the aircraft, for the aircraft, and about the aircraft … and Mr. TJ Horsager, Director Connected Aircraft Services told IFExpress. : “FLEX Developer is an open architecture solution that gives airlines more access to the technology.” We should note that the Gogo 2Ku solution is a global service solution (unlike the US ATG service) which started out as a passenger touch point, but now can use more bits to-and-from the aircraft, for aircraft data, allowing the airlines to use data to optimize their operations. . With some 20 airlines, 600+ aircraft flying, and some 2000 airplanes in backlog, it just made sense! 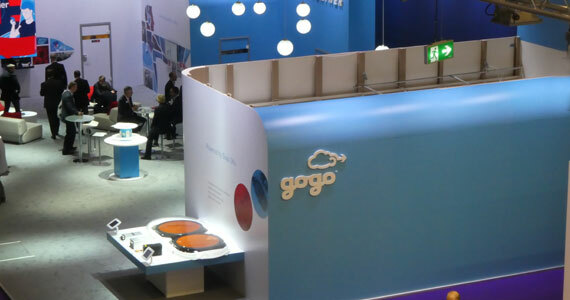 The Gogo FLEX System is a “new” way to think about Gogo. We might add that there is also “…a lot of interest from airline software teams”, so noted Gogo, and we expect there to be plenty of airline support from them using the above mentioned API’s and other tools and now with a large enough install base for connected aircraft services to be a business that operates on solutions developed by operational data-like performance, measurement, and even inflight “repair”. With a renewed focus on broader consultative engagements with its customers, Panasonic’s new Innovation Studios will serve as hubs for innovation, ideation, and solution-building. They will provide a socially collaborative environment where the company and its customers can leverage its skilled workforce and regionally relevant partners to ideate, prototype, showcase and evaluate product concepts, digital solutions and user experience paradigms. The first Panasonic innovation studio will open in the Silicon Valley by the end of 2018. The Studios will also serve as primary locations for airline workshops conducted by Panasonic’s digital design consultancy, Tactel. Acquired by Panasonic in 2015, Tactel has played an instrumental role in helping Panasonic customers get the maximum value from their inflight entertainment and connectivity (IFEC) investments. The company’s new Aspire widebody economy seat has entered service on a United Airlines’ Boeing 777-200 aircraft, the first in a 55 shipset retrofit program that begins delivery this spring. “We are excited to offer customers traveling on our 777-200 fleet a new Economy seat featuring updated design, with more living space and under-seat stowage,” said Mark Krolick, vice president of Marketing for United Airlines. Aspire offers an improved, patented comfort system with an advanced kinematic mechanism that cradles the passenger during recline while preserving maximum living space for each passenger. Aspire also incorporates increased under-seat stowage and greater passenger living space due to the proprietary seat frame and leg structure. Passenger amenities combine the latest generation Panasonic high-definition monitor for in-flight entertainment, a mid-level literature pocket combined with a full-width single piece food tray, aft-facing PC power on all seat assemblies and adjustable ergonomic headrests. 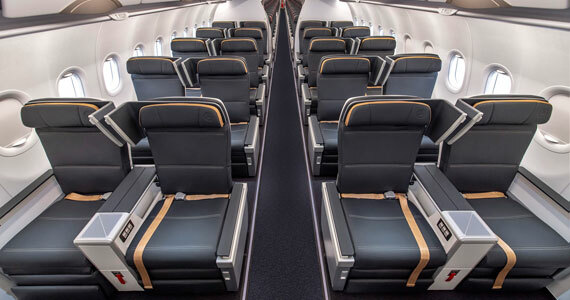 This version of the seat brings to life United’s latest brand themes and styling developed by PriestmanGoode. Following the launch on the 777, the new Aspire seat will continue its success on the Boeing 787-10 Dreamliner with United and then onto the Airbus A350 XWB and other 787 aircraft with other undisclosed customers that more than doubles the initial 777 program deliveries. Inmarsat announced that its new GX Aviation inflight broadband service is currently being rolled out on Qatar Airways’ Boeing 777 and Airbus A350 aircraft. Qatar Airways is the first airline in the Middle East and North Africa (MENA) region to offer GX Aviation, the world’s first inflight broadband solution with reliable, seamless high-speed global coverage provided through a single operator. In total, the service will be equipped on more than 130 of the airline’s Boeing 777 and Airbus A350 aircraft. The roll-out follows a highly successful inflight test campaign across Qatar Airways’ global flight routes. As part of the service offering, passengers will now be offered one-hour of free access to GX Aviation, after which full-flight access can be affordably purchased. Airlines connect to the GX network using exclusive new JetWave terminals produced by Honeywell Aerospace. The terminals are designed for ease of installation and maintenance to assure the lowest downtime for any cabin connectivity solution in the market, allowing installation with minimal labour and using standard tools available in maintenance hangars. The rollout of GX Aviation follows a separate announcement that Qatar Airways has activated an advanced new space-based system, supplied by Inmarsat, to track all of its flights across the world. Inmarsat worked exclusively with Qatar Airways to develop this cutting-edge solution, which utilizes Inmarsat’s market-leading satellite technology to provide the exact real-time location of the airline’s aircraft in latitude and longitude. Saudi Arabian Airlines (SAUDIA), the national airline of the Kingdom of Saudi Arabia, has selected SITA to support its strategic expansion plans by introducing modern, world-class IT infrastructure across 200 of the airline’s offices located in 100 cities and airports in 60 countries. The solution will support the airline’s global IT infrastructure which connects all SAUDIA outstations with its headquarters and various data centers worldwide. SITA, the IT provider to the air transport industry, will introduce its unique ATI Cloud solution, which will allow SAUDIA to manage and distribute its business applications, information and business services on-demand, anywhere in the world. The agreement also includes infrastructure, IT support and round-the-clock service through a dedicated service center. SAUDIA’s incremental growth and global expansion has seen the airline open new offices in key cities and in turn, has developed new IT requirements to support the demand for the carrier’s continued growth in passenger numbers in the Kingdom and beyond. Airlines are increasingly looking for specialized content and service providers to meet their requirements. SITA, with its global presence and expertise, was identified as a trusted partner to implement a solution that would drive greater efficiency and productivity. You might remember a few months back when we gave a link to the regularly updated Boeing B-52 disassembly, well now, updates 4 and 5 are online now and if you have never seen a big airplane disassembled, this is your chance. Wings are next. Face it, sometimes flying is just not as fun as it should, or used to, be. Why? Full planes, increasingly bad weather, longer flights, and worse seating, just to name a few. Now, here is what Apple’s Yim Cook said about AR/VR – “AR has the ability to amplify human performance instead of isolating humans,” he said on the same call. “So I am a huge, huge believer in AR. We put a lot of energy on AR. We’re moving very fast.” Further, the TechRadar folks said: “But despite it’s heavy focus thus far on AR, it seems Apple is keen to give users a choice in what they experience; either AR for an enhanced experience that keeps them present in the real world, or VR for those times users want to be transported somewhere else entirely.” Just one more thing…What if there were cameras on a plane that choosers could hook up to their Apple VR/AR glasses? Check out this link for more on the subject. United Kingdom | April 30, 2018– Inmarsat (LON: ISAT), the world’s leading provider of global mobile satellite communications, announced today that its new GX Aviation inflight broadband service is currently being rolled out on Qatar Airways’ Boeing 777 and Airbus A350 aircraft. Aircraft Interiors Expo (AIX), the global event that showcases the leading innovations in the passenger experience, is creating a platform for further innovation at this year’s show with the launch of an Ideation Hub. The Hub, will allow attendees from across the supply chain to synthesize future innovative ideas and collaborate on key issues relating to passenger experience. This is just one of the new features at this year’s show, which returns to the Hamburg Messe from 10th – 12th April 2018. The sessions will take inspiration from ‘related worlds’, along with trends and technology from other industries, to generate ideas that will seek to provide the customers of tomorrow with a more seamless passenger experience. Polly Magraw, Exhibition Director of the Aircraft Interiors Expo, says: “The Aircraft Interiors Expo has become known as the global showcase for innovation in the passenger experience. The Ideation Hub we are introducing this year will take this to the next dimension as we work with attendees including engineers, designers and innovators to foster collaboration within the industry at AIX. Bucher: Displaying a new space-saving galley and front-row monument combination – a lightweight galley that has been optimized for maximum storage space. Inflight Canada: Displaying the new FAST USB power system being installed on British Airways’ A320 family fleet. Juki: The first digital sewing system for heavy-duty seating. Mirus: New developments of its Hawk economy seating platform including IFE and power systems, as well as storage and comfort options. Molon Labe: Unveiling its S1: Space Seat, which is a non-sliding version of its Side-Slip Seat and targets the short-range market with several unique features. Soisa: The Glowing Experience in seat lighting which integrates ambient lighting into the seat cover. Vision Systems: The second generation electronically dimmable window, based on a new industrial process for enhanced optical quality and lower cost. WiFi Technologies: Officially releasing its Aviator WiFi private sitcom network that enables cockpit and cabin crew to use their own tablets as full mobile satcom terminals during flight. Other enhancements for AIX 2018 include an expanded FlightGlobal CabinSpace LIVE programme, where attendees will have the opportunity to hear industry leaders discussing the latest trends and insights on major industry topics on 10th and 11th April 2018. These include ‘consolidation and the interiors supply chain’, ‘the future of inflight entertainment’, and‘predictive maintenance and the connected aircraft’, with speakers from leading companies including Lufthansa Technik, Delta Airlines, Hong Kong Airlines and Bluebox Aviation, along with a market outlook briefing from FlightGlobal’s Ascend consultancy.On 12th April at 11am, attendees will be able to see for themselves the innovations showcased at this year’s Crystal Cabin Awards in the CabinSpace Live Seminar Theatre, Hall B3 Upper, as the eight winners will present their winning concepts. Both events will take place in the CabinSpace LIVE Seminar Theatre in Hall B3 Upper. The show-starter for AIX is the Passenger Experience Conference on 9th April, which brings together senior strategists from airlines, rail companies and from across the industry supply chain to holistically explore the latest passenger experience thinking with their peers. Visitors to the event will hear from leading speakers including Adam Wells, Head of Design at Virgin Galactic, Paul Priestman, Director & Chairman of PriestmanGoode, Célia Geslin, Head of Product & Customer Experience at Joon, David Lavorel, Chief Executive Officer of SITAONAIR, David Bartlett, Chief Technology Officer at Panasonic Avionics, Steve King, Chief Executive Officer of Black Swan Data, and Scott Savian, Executive Vice President ZEO at Zodiac Aerospace. In addition to keynotes on the topics of ‘New frontiers for transport and passenger experience’, ‘Disruptive possibilities and their impact on the airline industry’, ‘Creating the world’s first spaceline’, and ‘Future Horizons’, the PEC will feature focused breakout sessions exploring ’Convergence and Mobility’,’ Flexible & Sustainable Thinking  and ’Personalizing the passenger journey’. AIX is co-located alongside the World Travel Catering and Onboard Services Expo (WTCE) and Passenger Technology Solutions (PTS), a new event for 2018 showcasing and exploring the latest technology trends that are transforming the passenger journey. Together the three events, along with the Passenger Experience Conference (PEC) on 9th April, form Passenger Experience Week. Each year, Passenger Experience Week attracts more than 18,000 attendees from across the world, along with over 2,000+ VIP airline attendees from 260 unique airlines and lessors. Astronics Corporation (NASDAQ: ATRO), a leading provider of advanced technologies for the global aerospace, defense and semiconductor industries, announced that its wholly owned subsidiary, Astronics Advanced Electronic Systems (AES), received its first line-fit certification of the new EmPower® UltraLite in-seat passenger power system on a Boeing 737 Max 8 aircraft for TUI Airlines. 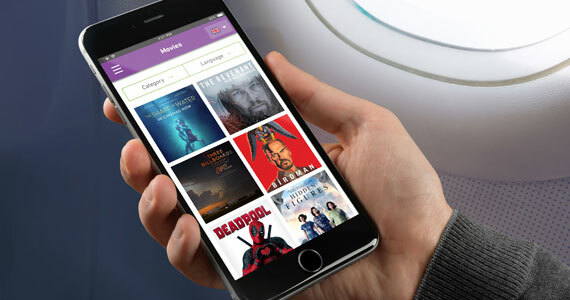 BoardConnect enables passengers to use streaming technology during a flight to access an airline’s entertainment program on their own devices. The product suite includes three hardware versions: In addition to the permanently installed classic BoardConnect solution, there is the flexible BoardConnect Portable version and the BoardConnect Plus connectivity solution. The BoardConnect 5.0 open aircraft IT platform runs on all three versions. Thanks to its modern docker technology, the software enables digital services from partners to be integrated easily and quickly. A demo at the booth shows how easy and fast new applications can be integrated using Docker technology. Lufthansa Systems is also providing content such as movies, TV series, music and magazines with its BoardConnect Media Services. All products work in perfect harmony with each other and can be acquired separately or in combination. Jan-Peter Gaense, Head of Passenger Experience Products & Solutions at Lufthansa Systems, will take part in a panel discussion on „Making IFE accessible for everyone“ (Wednesday, April 11, 11:30 am to 12:30 pm). Free online registration is required at https://www.flightglobal.com/events/aircraft-interiors-expo/forecast-sessions-2018/. Aegean ‎Airlines, the biggest airline in Greece, has signed a memorandum of understanding (MoU) with Airbus to purchase 30 A320neo Family aircraft comprising of 20 A320neos and 10 A321neos. The airline will also acquire a significant number of new A320neo family aircraft from leasing companies. Aegean currently operated a fleet of 46 Airbus aircraft (37 A320s, 8 A321s and 1 A319). The A320neo Family incorporates the very latest technologies including new generation engines and Sharklets, which together deliver at least 15 percent fuel savings at delivery and 20 percent by 2020. With some 6,000 orders received from nearly 100 customers, the A320neo Family has captured some 60 percent share of the market. Panasonic Avionics Corporation (Panasonic) and APT Mobile Satcom Limited (APSATCOM) announced a major evolution in connectivity for mobility markets – Extreme Throughput Satellite (XTS) service. APSATCOM is an affiliate of APT Satellite Company Limited (APT), the operator of the APSTAR satellite constellation. With this new satellite, the companies are building on a long-standing and successful capacity relationship. In addition, APSTAR-6D provides HTS coverage over the full field of view of the satellite including the Pacific Ocean, Indian Ocean, Australia and the Southern Oceans down to Antarctica. This includes areas not served by any other HTS satellite. Tailoring the capacity to areas of demand will provide Panasonic customers with better service, unprecedented coverage and the ability to dramatically increase throughput. One of the markets to benefit the most from XTS service is air transport. Today, 21 Asian carriers, representing over 800 aircraft, have already selected Panasonic for connectivity service, including many of the region’s leading airlines, such as Air China, All Nippon Airways, Cathay Pacific Airways, China Airlines,China Eastern, China Southern, EVA Air, Garuda Indonesia, Hainan Airlines, Hong Kong Airlines, Japan Airlines, Singapore Airlines, Thai Airways and Xiamen Airlines. 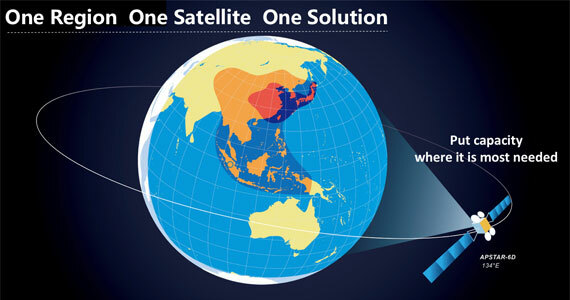 In addition, other leading airlines around the world that are Panasonic connectivity customers will use this advanced satellite capacity as their aircraft fly routes to and over Asia. This XTS satellite will be integrated into Panasonic’s recently launched third generation communications network, which is built to meet the growing connectivity demands of airlines and their passengers. This flexible network is designed to place capacity where it’s most needed across the globe to meet demand. Panasonic’s third generation communications network supports the provision of services such as fast internet, video streaming, VoIP applications, improved TV picture quality and broader channel choice, 4G phone services, and greater bandwidth for crew applications. 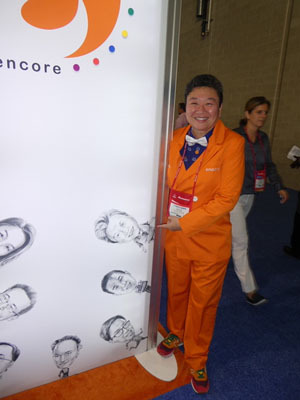 The network is backed by Panasonic’s new Customer Performance Center, which drives improved network performance, greater reliability, and faster response and resolution times, along with business intelligence tools and reports that provide customers with the data and analytics to deliver and monitor targeted pricing and advertising campaigns. Passenger Technology Solutions (PTS), the brand new event focused on how technology can help create a seamless passenger journey, has today revealed the major companies and cutting-edge start-ups that will speak at the inaugural show. The event, which takes place in Hamburg from 10 – 12 April, will explore how technology can be ‘in the DNA’ of the passenger journey, featuring speakers including Jorge De Luis Sierra, Cabin Interior Design Manager, Airbus, as well as representatives from Norwegian and US rail operator Amtrak. PTS will also feature some of the most exciting disruptors and pioneers in the industry, with contributions from social listening experts Black Swan Data, design consultancy Reaktor and brand experience management agency branding.aero. In addition to exploring travel’s most topical technologies, PTS will also showcase best practice: for example, the newly reopened Changi Airport, where the entire passenger journey is designed to be seamless and automated. Gillian Jenner, Editorial Director, Passenger Technology Solutions, said: “My experience putting together speaker programs in this space goes back many years, but curating the line-up for PTS has been especially interesting. It has been an opportunity to ‘zoom out’ from specific technologies and trends to consider what these innovations can achieve when combined. “It is this focus on the bigger picture that I believe makes PTS a must-attend for anyone involved with passenger experience – whether in aviation, rail or one of the many other services that shape the journey.” For more information about the educational program at Passenger Technology Solutions, visit: www.passengertechnologysolutions.com/programme. SITAONAIR is delivering a next-generation connected aircraft ‘smart core’ that will significantly enhance airline data communications and operations. The company has partnered with Astronics Ballard Technology to provide an integrated product solution using their new webCS® Wireless Aircraft Communications Server along with SITAONAIR’s e-enabled application software. This closely-integrated software and hardware solution greatly reduces deployment complexity and will bring even greater value to SITAONAIR’s airline customers – delivering enhanced capabilities and operational efficiencies – empowering airlines to realize the promises of the connected aircraft. The ‘smart core’ brings together the vast connected aircraft data collected by SITAONAIR’s e-Aircraft® DataCapture solutions for cockpit, cabin, and aircraft operations. It then distributes this SITAONAIR-processed data onboard using Astronics Ballard Technology’s flexible webCS, a smart AID/server/router that securely bridges avionics data with wired and wireless networks in a single compact box. Today’s offering of an integrated product will further enhance airline customers’ data management approach. The combination of SITAONAIR’s established portfolio of passenger, crew and flight operations solutions with Astronics Ballard Technology’s innovative hardware and strong technical expertise in the area of aircraft avionics interfacing, will form a central pillar of airlines’ connectivity and e-enablement strategies, delivered to airlines as a managed service. Next, An industry-leading weather-alerting feature, empowering flight dispatchers to avoid or anticipate weather disruption throughout flights, has been launched as a new feature of SITAONAIR’s AIRCOM® FlightTracker, in partnership with DTN. Airline dispatchers using AIRCOM® FlightTracker will now be equipped to help aircraft avoid inclement weather – including aircraft-specific turbulence, icing, and thunderstorm forecasts – supporting the smoothest and safest possible flight experience for those onboard, and maximizing fuel efficiency. Already adopted by airlines operating more than 250,000 flights every month, SITAONAIR’s AIRCOM® FlightTracker is a ground-based software system delivering vital global real-time aircraft position alerting to airline operations teams. The application aggregates the best available inflight position data from a wealth of sources – including cutting-edge spaced-based ADS-B provided by FlightAware and Aireon using the Iridium NEXT satellite constellation – on a single aircraft position display. What’s more, no modifications to the aircraft are required to activate it. Interest in FlightTracker, and its enhanced, 100% global minute-by-minute update capabilities, is accelerating as the industry counts down to the ICAO GADSS 15-minute flight-tracking recommendation, coming into force in November 2018. The incorporation of DTN’s Flight Route Alerting data represents an important addition to the solution, making it indispensable to flight operators in their flight planning and flight following. ITAPassengers flying with British Airways from Orlando International Airport (MCO) to London Gatwick are enjoying a secure and seamless departure with new biometric boarding at the gate. A quick photo is all that is needed to board the international flight – no passport, no boarding card – thanks to innovative technology. SITA, the global air transport IT provider, integrated automated boarding gates with the US Customs and Border Protection (CBP) and airline’s IT systems to allow the necessary checks and authorize boarding. This is a joint initiative by the Greater Orlando Aviation Authority (GOAA), British Airways and CBP to incorporate the US biometric departure (exit) check for passengers as smoothly as possible. SITA, using its extensive airline and airport expertise, has ensured fast and easy implementation for the airport and airline. By merging the usual boarding procedures with the CBP biometric exit check, SITA is delivering a smooth experience for passengers. A quick photograph taken at the gate is used to confirm passengers’ identities and authorization to travel. Norwegian Air will feature Arthur Collins, the founder of Rockwell Collins, as a “tailfin hero” on the airline’s Boeing 737 MAX and 787 Dreamliner aircraft throughout 2018. Collins joins over 80 other tailfin heroes depicted on Norwegian aircraft since the airline began operations in 2002. Collins, born September 9, 1909, was an electronics enthusiast from a young age. At the age of 15, he was an avid ham radio operator making contact with other ham operators around the world. He founded Collins Radio Company in the basement of his home in Cedar Rapids, Iowa, which was formally incorporated in 1933. The company, renamed Rockwell Collins in 1973, initially designed and produced shortwave radio equipment, but has grown to become a leader in cockpit, cabin, communication and connectivity solutions provided by nearly 30,000 employees worldwide. His full story can be found here. GSA and Thales launch the EDG²E project to further optimize aviation navigation with Galileo. The European Union’s Global Navigation Satellite Systems Agency (GSA) has officially launched the EDG²E project (Equipment for Dual frequency Galileo GPS and EGNOS) with a consortium led by Thales. This four-year project intends to develop a dual-frequency multi-constellation receiver, enabling enhanced navigation capabilities, support standardization and certification preparation. The consortium includes Thales, Thales Alenia Space and ATR, as well as contributions from Dassault Aviation and the French Civil Aviation Authority (DGAC). Inmarsat snagged European Space Agency (ESA) contract to develop satellite communications services that will deliver 4D trajectory air traffic management from 2020. Today, Boeing employees gathered around the 10,000 B737 MAX 8 for Southwest Airlines, which has broken the Guinness World Record title for the most produced commercial jet aircraft model. Austin, Texas | February 21, 2018– Satcom Direct (SD), the business aviation connectivity provider, is celebrating 10 years of partnership with global mobile satellite communications business Inmarsat. The milestone anniversary, which acknowledges SD’s support of the SwiftBroadband service, was announced to delegates attending SD’s annual Connecting with Customers, CwC, client and partner event, being held in Austin, Texas. To mark the significance of the relationship, Inmarsat’s Rupert Pearce, CEO, presented SD President David Greenhill, with a framed version of the original license at the CwC event. Inmarsat confirmed SD as an aerospace distribution license partner in 2008, which enabled the business to begin reselling Inmarsat’s IP-based data service, SwiftBroadband, to the aviation sector. Since then, SD has maintained its position as Inmarsat’s largest aeronautical service provider and has been recognized as a significant enabler for the growth of the SwiftBroadband service. Looking forward, SD will continue to support SwiftBroadband services for the international business aviation sector, in addition to expanding its provision of the ultra-high speed broadband JetConneX service delivered by Inmarsat’s Global Xpress satellite constellation. Both SwiftBroadband and JetConneX systems are supported by the SD router family, which optimize in-flight connectivity efficiency, as well as delivering a growing portfolio of SD applications. “We are delighted to mark a decade of working with Inmarsat to provide high-speed data services to aviation. When we first received our license the concept of a digitized, connected, business aviation network was still very new. Today it is a fundamental part of aircraft operations and is a part of the business that we are committed to supporting, developing and evolving. Strong, long-term relationships with our partners are essential to our mutual success, but more importantly, enable us to provide our clients with the connectivity they expect. We look forward to our next decade supplying these services,” said Greenhill. Luxembourg | February 14, 2018– Gogo, the leading global provider of broadband connectivity products and services for aviation, announced today that it has more than 200 aircraft equipped with its 2Ku inflight connectivity technology which are now utilizing the increased capacity delivered by SES-15. These aircraft came online in SES-15’s first operational month and are the first to benefit from the new high throughput satellite (HTS) capacity. SES-15 entered service in January 2018 and is SES’s first hybrid satellite providing Ku-band wide beams and Ku-band spot-beam capacity over North America, Mexico, Central America and the Caribbean. Due to SES-15’s high-powered HTS beams, all Gogo aircraft outfitted with its next generation modem will experience an even better customer experience with improved economics. All new 2Ku installations enter service with the upgraded modem, and all 2Ku equipped aircraft are expected to have the new modem by the end of this year. Airbus, Boeing, Inmarsat, and Other Stuff! The A350-1000, the newest member of Airbus’ leading Widebody family, has embarked on a three-week Demonstration Tour to the Middle-East and Asia-Pacific region.The tour follows the completion of a successful flight test campaign, which lasted less than one year and culminated in joint EASA and FAA type certification, demonstrating the aircraft’s excellent design, performance and maturity. The A350-1000 tour comes ahead of the first customer delivery to Qatar Airways in the coming weeks. 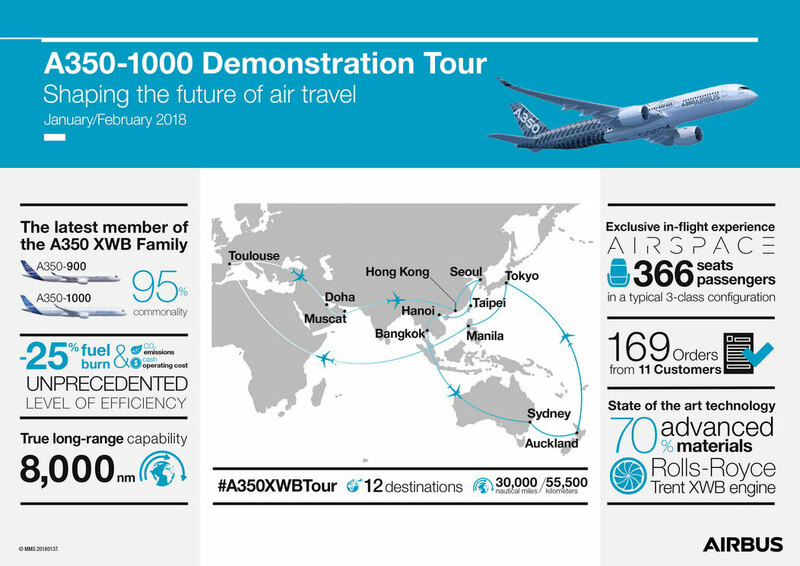 During the tour, the A350-1000 flight test aircraft (MSN065) will visit 12 destinations to demonstrate the aircraft’s exclusive features to airlines. The itinerary will see it travel over 30,000 nautical miles. The aircraft will stop for several days in Singapore, where it will be on static display from 6 to 8 February at the Singapore Airshow 2018. (see below). MSN065 is one of the three Airbus A350-1000 test aircraft and is equipped with a fully functional cabin (40 business class, 36 economy plus class and 219 comfort economy class seats). The A350-1000 is the latest member of the A350 XWB family, showing high level of commonality with the A350-900 with 95% common systems part numbers and Same Type Rating. 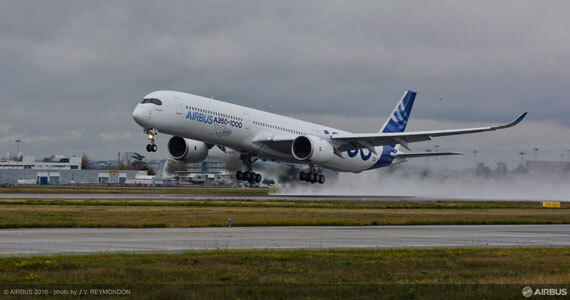 As well as having a longer fuselage to accommodate 40 more passengers than the A350-900 (in a typical 3-class configuration), the A350-1000 also features a modified wing trailing-edge, new six-wheel main landing gears and more powerful Rolls-Royce Trent XWB-97 engines. To date 11 customers from five continents have placed orders for a total of 169 A350-1000s. You can follow the A350-1000 tour live on twitter: @airbus and #A350XWBtour if you are into that stuff. Next, Airbus has launched a new iflyA380 iOS app that takes advantage of Apple’s latest technology, to open the doors of its iconic A380 aircraft to more passengers worldwide. The new app enhances Airbus’ existing iflyA380.com booking assistant with more choices, features and content and new possibilities to interact with the A380 (including taking a sneak peek at the cockpit). Customers today increasingly expect to design their own experiences and the app gives them the power to do so. Booking flights and staying updated with real-time notifications is just the beginning. Travelers will also enjoy a wide range of exclusive innovative services linked to the A380, including the option to explore destinations based on geolocation and personal interests and cabin discovery in Virtual Reality. You might also enjoy a connected and immersive in-flight experience based on an Augmented Reality feature. “Response to the iflyA380.com website has been fantastic.” says Marc Fontaine, Airbus Digital Transformation Officer. “The iflyA380 app is a new step for Airbus towards offering digital services that directly benefit consumers and allow them to design their own experiences.” With the new app, Airbus set out to make the passengers’ favorite flying experience even more memorable, from travel inspiration to their final destination. Boeing announced its investment in Berkeley, Calif.-based Cuberg, Inc., a startup founded by former Stanford University researchers developing next-generation battery technology for potential aerospace and industrial applications. Cuberg developed an advanced battery cell that is designed to be a drop-in solution to existing large-scale battery manufacturing processes. It combines a lithium metal anode, proprietary electrolyte and high-voltage cathode to achieve high energy density and thermal durability. “Cuberg’s battery technology has some of the highest energy density we’ve seen in the marketplace, and its unique chemistries could prove to be a safe, stable solution for future electric air transportation,” said Steve Nordlund, vice president of Boeing HorizonX. Since it was established in April 2015, Cuberg has grown with several rounds of financing and grant funding, and signed a multimillion-dollar joint development agreement with an industrial battery manufacturer. Cuberg CEO Richard Wang is currently a member of the Cyclotron Road entrepreneurial research fellowship program located at Lawrence Berkeley National Laboratory. Cuberg previously participated in the TomKat Center for Sustainable Energy’s Innovation Transfer Program at Stanford University and was named one of the top seven startups in the U.S. Department of Energy’s 2016 National Cleantech University Prize competition. “We are excited to partner with the world’s largest aerospace company to extend Cuberg’s battery capabilities to help power the aerospace platforms of the future,” said Wang. “With funding from Boeing, we will expand both our team and our research and development facilities to help customers integrate our batteries into their products, while also scaling up our technology to fully automated production.” Boeing HorizonX Ventures led this second seed investment round, which included a follow-on investment by HPC Energy Services, a Canadian integrated oil and gas product and service company. This is Boeing HorizonX Ventures’ first investment in an energy storage company since the fund was established in April 2017. Inmarsat has been crowned a winner at the Inflight Middle East Awards in Dubai for its ground-breaking inflight broadband service, GX Aviation. Inmarsat received the highest votes from an independent panel of judges in the ‘Connectivity Enablement’ category, taking the lead over other competitors in the market.Offering state-of-the-art, uninterrupted, global inflight connectivity, GX Aviation enables airline passengers to seamlessly browse the internet, stream videos, check social media and more during flights, with an onboard connectivity experience that is comparable to the mobile broadband services they may receive on the ground.The service currently boasts a constellation of four satellites, flying in a geostationary orbit, providing global coverage across commercial airline routes. The Inflight Middle East award is also reflective of Inmarsat’s continued investment in the network to ensure passengers are provided with the quality Wi-Fi they have come to expect at 35,000 feet. A new, very high-throughput satellite will launch next year to provide even more capacity across the Middle East, Europe, and the Indian subcontinent. Inmarsat’s new inflight internet solution has more than 1,300 commercial aircraft expected under signed contracts. GX Aviation is already commercially available with launch customers Lufthansa Group and Air Astana, while additional mandates have also been won from other leading airlines such as AirAsia Group, Air New Zealand, Singapore Airlines, Avianca and Norwegian Air Shuttle. Airlines connect to the GX network using exclusive new JetWave terminals produced by Honeywell Aerospace. The terminals are designed for ease of installation and maintenance to assure the lowest downtime for any cabin connectivity solution in the market, allowing installation with minimal labor and using standard tools available in maintenance hangars. The company installs simple terminals that you advise your feelings about a place or a thing (mostly). Here is a tiny part of the push button product story you should read: “HappyOrNot’s international breakthrough came at Heathrow Airport. Passengers had been complaining that security workers there were rude and incompetent, and, as the 2012 Summer Olympics approached, the airport’s executives worried about the imminent influx of international visitors. They positioned HappyOrNot terminals so that passengers could use them as they cleared security. The executives were now able to identify problem locations in real time, and security workers in low-rated areas could see when they were viewed as more annoying than colleagues in other parts of the airport. Very quickly, Theisen told me, Heathrow security’s over-all passenger-satisfaction scores rose by more than half.” Here is the point – It is often difficult to get customer views if they have to fill out a big form or even talk to a reviewer. IFExpress firmly believes that this is the future of customer reviews. The only real issue we see is that people are most likely to take the time to participate in a review if they have had a bad experience vs. a good one – its just human nature to express themselves more when annoyed vs. taking the time to point out a positive experience. Upset; however, and you want to do something! London, UK | January 25, 2018– Inmarsat, the world’s leading provider of global mobile satellite communications, has been crowned a winner at the Inflight Middle East Awards in Dubai for its ground-breaking inflight broadband service, GX Aviation. Inmarsat received the highest votes from an independent panel of judges in the ‘Connectivity Enablement’ category, taking the lead over other competitors in the market. Offering state-of-the-art, uninterrupted, global inflight connectivity, GX Aviation enables airline passengers to seamlessly browse the internet, stream videos, check social media and more during flights, with an onboard connectivity experience that is comparable to the mobile broadband services they may receive on the ground. 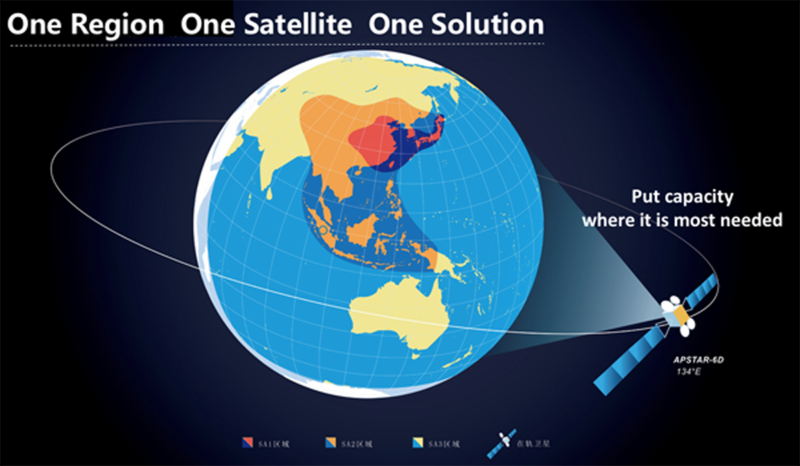 GX Aviation currently boasts a constellation of four satellites, flying in a geostationary orbit, providing global coverage across commercial airline routes. The Inflight Middle East award is also reflective of Inmarsat’s continued investment in the network to ensure passengers are provided with the quality Wi-Fi they have come to expect at 35,000 feet. A new, very high-throughput satellite will launch next year to provide even more capacity across the Middle East, Europe, and the Indian subcontinent. The latest accolade from Inflight Middle East adds to a growing number of awards for Inmarsat’s inflight Wi-Fi services, including ‘World’s Leading Inflight Internet Service Provider’ at the World Travel Awards. It comes hot on the heels of news that Qatar Airways will provide GX Aviation onboard more than 130 aircraft, consisting of Airbus A350s and Boeing 777s, and Emirates intends to install the service on its Boeing 777X aircraft fleet. Inmarsat’s game-changing new inflight internet solutions has more than 1,300 commercial aircraft expected under signed contracts. GX Aviation is already commercially available with launch customers Lufthansa Group and Air Astana, while additional mandates have also been won from other leading airlines such as AirAsia Group, Air New Zealand, Singapore Airlines, Avianca and Norwegian Air Shuttle. Inmarsat is transforming the global aviation industry with a vision of bringing complete connectivity to every aircraft and flight path in the world. As the only aviation broadband provider capable of connecting the complete aircraft from cabin to cockpit, Inmarsat’s world-leading passenger solutions are complemented by its best-in-class safety and operations services. Thales will equip the subsidiary airlines of HNA Group with its latest In-Flight Entertainment (IFE) system on its fleet of 42 wide-body A330 and 17 A350 XWB aircraft. Thales selected by HNA Group to equip new 42 A330 and 17 A350 XWB fleet with the latest IFE innovations. AVANT IFE and Ka-band connectivity will be fully integrated on the A330 and A350 to provide a premium passenger experience. California | January 9, 2018– Thales will equip the subsidiary airlines of HNA Group with its latest In-Flight Entertainment (IFE) system on its fleet of 42 wide- body A330 and 17 A350 XWB aircraft. The first AVANT A330 aircraft has entered into service in late 2017 and the first AVANT A350 aircraft is expected to enter into service in the 3rd Quarter of 2018. HNA group manages several subsidiary airlines, including Hainan airlines, Capital Airlines, Tianjin Airlines, Lucky Air and West Air. In 2017, Hainan Airlines was honored as Top 10 Airlines by SKYTRAX, a global research firm and provider of professional aviation evaluation services with a focus on airline and airport services. The subsidiary airlines of HNA group already have a combined fleet of over 50 A330 aircraft flying with Thales IFE systems. HNA Group’s selection of Thales is a further demonstration of the carriers trust in Thales’s commitment to making the travel experience more enjoyable for their passengers. As part of this commitment, Thales is investing resources in the region to further enhance the integration of software and media capabilities that will enrich passenger experience and satisfy local market demands. AVANT, Thales’s state-of-the-art Android IFE solution, will provide HNA Group Airlines’ passengers a highly customizable experience with a robust selection of features and applications. The new fleet will be equipped with the latest AVANT full high-definition monitors, the most lightweight ever deployed, featuring the Avii Touch Passenger Media Unit. Avii provides intuitive navigation, full android smartphone look and feel, and acts as a second entertainment screen. Integration of Ka-band connectivity to the AVANT IFE system will provide a fully connected premium passenger experience. Thales FlytCARE, the nose-to-tail- maintenance of in-flight technology ensuring the highest levels of performance, already provided on current HNA Group Airline fleet, will be expanded to these new aircraft. The dedicated Aircraft Technical Services team, will support system reliability for the enhancement of passenger experience. Las Vegas | January 8, 2018–Panasonic Avionics Corporation (Panasonic) has today introduced a major evolution of its satellite connectivity service with the introduction of its third generation communications network. The Customer Performance Center offers a range of value-added services including traffic shaping tools, live monitoring and management of the user experience, and Panasonic’s ZeroTouch™ service, which enables real-time content loading, validation and management. Welcome back to IFEC in 2018, and thank you for following us throughout 2017. Having said that, this coming New Year ought to be one of the most interesting years for our technology, and almost everything else for that matter. But before we get ahead of ourselves, we wanted to pass along a short 2018 New Year message from Joe Leader, CEO of APEX and IFSA: “As we launch into 2018, APEX celebrates its 40th year of serving the passenger experience industry with every major airline in the world. The year ahead will see ancillary revenue tying into more facets of new products. In addition, we expect that this is the year that in-flight Wi-Fi surpasses 50% of available seat miles worldwide. It’s going to be an incredible year with major advancements.” We have a feeling he is right on track for this industry and he said it – the IFEC future will be a big deal in 2018, and we certainly agree – with inflight Wi-Fi becoming the passenger necessity. Furthermore, we agree with Mr. Leader’s comment that over 50% of available seat miles will have access to inflight Wi-Fi this new year, with the result being new innovations that will generate both passenger and flight revenue. Thanks Joe! Last year in IFExpress we wrote about the value of messages and that connectivity was the solution for doing so – what we said then is even more relevant today: “While 2016 may have a few techno-changes from 2015 and summary numbers differ, we are riding the same messaging train! Since technology and media have grown so much (at least in the US) folks are spending more time on it than sleep or work (Business Insider), there appears to be plenty of opportunity time for messaging (Facebook, Twitter, and the like) but messaging will be even bigger. If you don’t believe it, just watch the ‘head down time’ at a public function where time is spent on devices – it’s less invasive and non-interruptive. Why is this a boom time for messaging, you might ask? The answer must lie in new, portable communication technology for one. If, as some writers predict, we spend over half of our waking day with media and technology, and because the devices and connectivity mediums are there, plain and simple, we will text. From a broader perspective, time on major digital activities will increase, and has done so for each year, for the last 5 years.” Needless to say, we do not expect the demand to diminish as far as passengers expectations for messaging real-time inflight, in fact, we anticipate the demand to grow exponentially. What we missed for 2017 was the new “beyond” Basic Economy package rolled out this past year with these extreme lack of features : even lower cost seats, seat selection and upgrades are not available, group and family seating is not available, full-sized carry-on bags are not permitted, one personal item is allowed, flight changes and refunds are not allowed, certain MileagePlus and Premier member benefits are not available, and they are the last boarding group. However, United notes: Basic Economy fares provide most of the same inflight services and amenities that are available with standard Economy — such as food and beverages, United Wi-FiSM and inflight entertainment. One area where IFExpress fell short in our forecast for 2017 was company employees. We predicted the following for 2017: “We fear aviation manufacturing layoffs”…While employee data is a little shaky because of the multitude of companies within a large corporation; we predicted a decline in employees from 2016 to 2017. When we looked in 2016, Boeing had 150K+ workers – today, it is around 174K. Airbus is also up. We should also note that there are a lot of industry changes (not aviation) that will affect IFEC in the coming year. Video on Demand/LiveTV will surely eventually affect inflight entertainment and connectivity. Artificial Intelligence and Blockchain may as well. In 2018 blockchain will move beyond standard banking applications to money transfer, insurance, digital identification and even insurance, it will be on the aviation near horizon. Similarly, edge computing (near the source of data to reduce transmitted data) could be at the heart of aviation control, monitoring and data communication. With the airplane a trove of unanalyzed data and passengers desire to send and receive more data, connectivity, IFE, and TV, data will be the new connection from the air to the ground and vise-versa – not to mention smart bag issues, power-at-a-distance charging systems; as well as, increased satellite payloads ($11B – 2017 to $18B – 2022) and service providers. Anyway, another year has passed and IFExpress is now in its 26th year and we still love the craziness of this entertainment and connectivity based aircraft show, albeit, it is getting harder to stay current with all the ups (and downs) of technology, connectivity, seat shrinkage, increased baggage payments, super long haul travel, passenger biometrics, security, and political impacts on the rights and preferences of travelers. There are even bigger changes coming: Net Neutrality and it’s effect on aviation and connectivity neutrality, higher prices coming, airport and possible airplane biometrics, Wi-Fi vs embedded IFE, prospective “splitter” customers, younger airline customers, and even Amazon in the business! 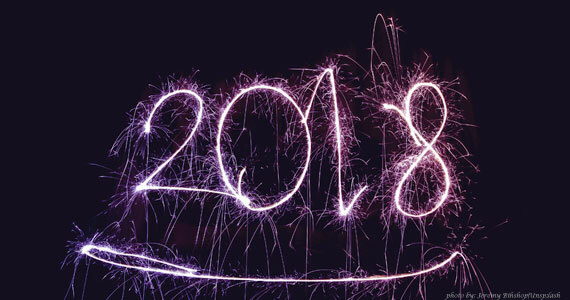 However, because each year we are surprised, entertained and enlightened by the creativity and brilliance of many of the industry engineers, marketeers and developers, we again will close with the words of Arthur C. Clarke: “Any sufficiently advanced technology is indistinguishable from magic.” Enjoy the MAGIC! Editor’s Note: Just in case you feel like quitting this year, watch this — and NEVER GIVE UP! Astronics Corporation announced that it has formed the Astronics Connectivity Systems and Certification (CSC) group by combining the recently acquired Telefonix PDT and Astronics Armstrong Aerospace. The new group will serve the needs of aerospace connectivity providers with a complete set of hardware, integration engineering, installation design, and certification services to enable aircraft in-flight entertainment and connectivity (IFEC). Astronics CSC will continue to offer the products and services formerly offered by Armstrong Aerospace, working both within Astronics and with its industry partners to certify and install new IFEC, power, and other systems on commercial and business aircraft. 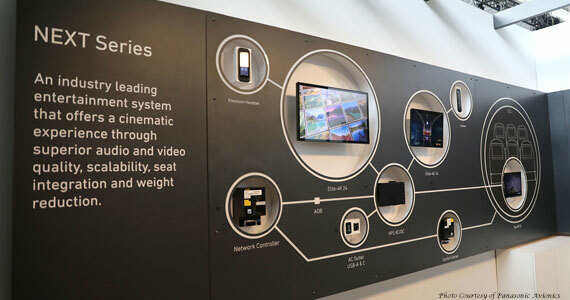 Astronics CSC will also continue to offer the products previously marketed by Telefonix PDT, including its cord reels and in-flight connectivity hardware such as wireless access points, servers, and control components. Product Development Technologies (PDT), a product design and development consultancy, will operate independently within the Astronics CSC structure. The new Astronics CSC group will complement the connectivity and data solutions from other Astronics subsidiaries, including Astronics AeroSat, manufacturer of SATCOM antennas, and Astronics Ballard Technology, manufacturer of cockpit connectivity components. Astronics CSC will continue to operate from its existing office locations in the greater Chicago area with current personnel. Michael Kuehn, formerly the president of Telefonix, will serve as the president of Astronics CSC. For details on the new group, please visit Astronics.com. Rockwell Collins has been named America’s Most JUST Company in the Aerospace & Defense industry, according to Forbes and JUST Capital, a nonprofit that ranks the largest publicly traded corporations in the United States on the issues Americans care about most. The second annual JUST 100 ranking compares America’s companies head-to-head, based on the priorities of the American people. The company is celebrating a decade since the first ever inflight cellular data transmission and the birth of Mobile ONAIR. Since that initial transmission was made onboard an Airbus A318 flight on 17 December 2007, it has been installed in more than 550 aircraft, serving the changing needs of commercial, VIP and governmental flights alike. Over the past decade, and with support from SITAONAIR’s industry partners, the service has been made available across all aircraft types, from single-aisle to long-range – with more than 20 million passengers connecting for voice, SMS and data transmission in 2017 alone. SITAONAIR and satellite communications provider Inmarsat worked in partnership on that milestone flight ten years ago, and since these exciting early days, the service has continued to evolve, with developments such as the recent deployment of cutting-edge inflight 3.5G mobile network services over the high-speed broadband satellite connectivity of Inmarsat’s GX Aviation. This aviation industry first sees passengers and crew benefit from high-speed and seamless connectivity, which is comparable to the home experience. Mobile ONAIR also enables passengers to utilize simple, secure and reliable connections that contribute to 43% of frequent fliers citing cellular connectivity as their primary choice. This is complemented by the continued evolution of pricing models, from the comparatively expensive price-per-use model that dominated until 2013, to the unlimited mobile data bundles commonly seen today, and the ‘Roam Like at Home’ model, which is set to become the norm across Europe. Thanks to SITAONAIR’s work in obtaining regulatory approval and securing mobile operator partnerships, the Mobile ONAIR service is truly global. It is easy to forget a time, not so long ago, when passengers turned off mobile phones onboard an aircraft. SITAONAIR, together with partners and customers, has helped secure the regulatory approval, at state and industry level, to make the dream of inflight mobile connectivity a reality for the whole industry. SITAONAIR’s latest infographic highlights how cellular data is a crucial ingredient for a first class passenger experience, cementing Mobile ONAIR’s relevance in the connected airspace. Gregory Ouillon, Chief Technology Officer at SITAONAIR, says: “It’s remarkable to think that it was just ten years ago that SITAONAIR launched the world’s first inflight mobile service onboard an international flight. “Ten years is a long time in aviation, however, and the solution now has evolved to become an essential component of the full cabin connectivity experience, allowing passengers to use their mobile phones as they would on the ground. “One major shift has been the trend towards the convergence of Wi-Fi and cellular technologies, which delivers the best of both worlds. Passenger expectations can be met by offering a hybrid experience that can leverage the advantages of both a Wi-Fi and a cellular connection. Importantly, SITAONAIR is one of the few industry players with the knowledge, assets and skills base to make this convergence happen.” This convergence is essential to meet the demands of the modern passenger. With 50-100 billion Internet connected devices expected to be in circulation by 2020, ranging from fitness trackers to thermostats, mobile network operators will play a central role in connecting these devices, both on the ground and in the air. Editor’s Note: We really were impressed with this graphic and to download it in full, click here. AIRBUS named Guillaume Faury as next President-Commercial Aircraft to replace Fabrice Brégier, who is stepping down in February 2018; CEO Tom Enders also advised that he does not wish to seek another term beyond his mandate ending April 2019. Boeing’s 737-MAX10 was also believed to be under consideration. But, a recent trade dispute triggered by a complaint filed by Boeing concerning Delta’s order for 75 Bombardier C Series jets has soured the relationship between airline and airplane maker may have soured the deal. AI: What’s Working, What’s Not – Andreessen Horowitz This video of a technical presentation at a meeting you probably missed – Great Stuff for those who want more in AI! Need some current cryptocurrencies technical research over the holidays? How about Blockchain Technologies? What is Blockchain Technology? Before we forget it, HAPPY HOLIDAYS everyone, and thank you for your support for the past 24 years!